A woman on her bicycle pulled over in Greenpoint, Brooklyn, on Thursday to greet a couple of familiar faces. She jumped right into the conversation. 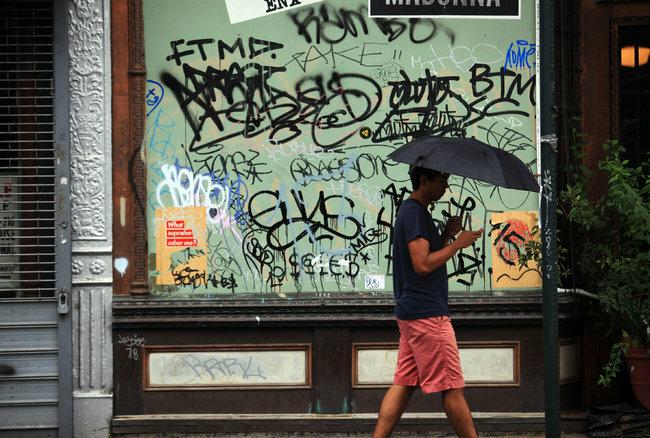 “Bad,” replied Gina Argento, indicating some illegible scrawls across the street. It is a far cry from “good,” the 1970s-era murals that made artists of lanky youths with spray paint. Which, for the record, no one seems to want, either. 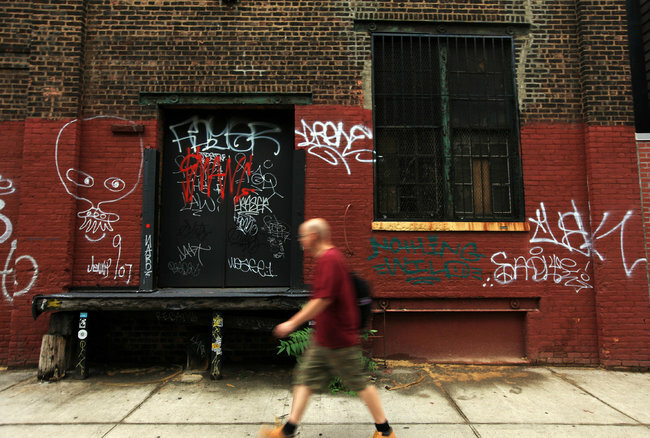 Greenpoint’s graffiti problem is as stubborn as unchecked mold. It is everywhere, even greeting visitors to Brooklyn upon their arrival from Queens over the Pulaski Bridge. There is graffiti on brick walls and painted walls and on glass doors and poles. 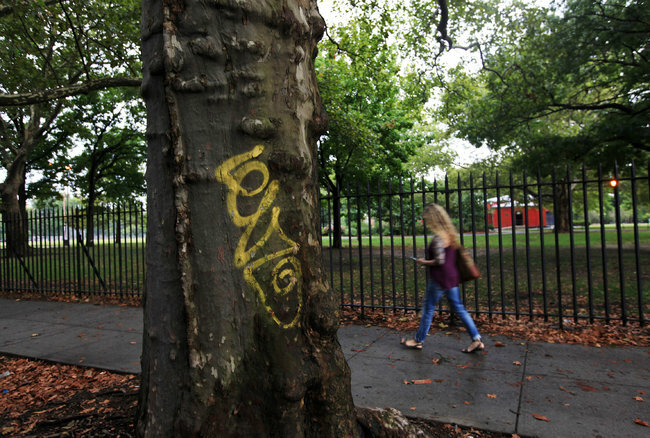 Trees are tagged with paint. Someone scrawled on a “Stop Bed Bugs” sign on a remote corner. In the men’s room of the Manhattan Three Decker diner, someone wrote “Shy Guy” on the plastic sign that says employees must wash their hands. And in a small room in St. Anthony of Padua Church, people have been known to scratch names or short prayers (“Please help me”) into the feet of the statues of saints. A sign outside Eli & Ali’s, a tomato wholesaler on Meserole Avenue, offers a $500 reward for information leading to a graffiti arrest. A manager said no one has called to collect. In one corner of Greenpoint, where the good-versus-bad conversation was taking place, there are other, more welcome sights that have become commonplace. People who do not look like they belong on gritty, graffiti-marked streets. Like Tom Selleck, Julianna Margulies and big-shot executives from CBS. Nearly every episode of “Blue Bloods” ends with the family of Frank Reagan, the New York City police commissioner played by Mr. Selleck, sitting down to a big dinner in his dining room. In the show, the home is in Bay Ridge, Brooklyn, but in reality, it is on a stage on Calyer Street in Greenpoint, on a block of corrugated metal strewn with graffiti. This, Mr. Argento does not need. “I’ve painted over graffiti on Saturday morning, and on Saturday night it’s back again,” he said. He walked past a wall with a bright blue scribble of spray paint. “This is a new guy,” he said. One day in the spring, Mr. Argento arrived at one of his offices, on Norman Avenue, to find the glass front doors defaced by some sort of acid, and the brick interior marked in paint. Surveillance video showed young men arriving in two cars, with some acting as lookouts while others sprayed. Bobby Mari, whose corner bar is called the Place, saw a new graffiti drawing outside on Thursday. Who knows who did it, he asked, with a choice word tucked in for emphasis. He and the Argentos have helped organize several cleanups, drawing young men and women from the Greenpoint Youth Court and other groups. Mr. Argento said he had stopped asking his neighbors if they’d like him to paint their tagged walls — he just does it. All the talk of graffiti was interrupted by another visitor on Thursday morning. Along came Bill de Blasio, the public advocate and a Democratic candidate for mayor, in a crisp blue shirt and striped tie He stopped before a couple of television cameras and reporters and spoke of the importance of the television industry in Greenpoint. Hearing him describe the growth arc of the studio, it is hard to imagine its owner slinging paint on Saturday mornings.